Do you have any fabric scraps larger than 1” that you aren’t using? Thought so! If you are a quilter, that’s a rhetorical question indeed. So, on that note, let’s get started. Using the bag of scraps provided to you from our Kinship Quilters Facebook Sew-Along Group, I’m going to show you how to create the fastest one-of-kind quilt block. First things first….now, it’s up to you, but, most of the time, this method involves ZERO planning or forethought. It’s usually a therapeutic destash time requiring no brainpower….yes, I said NO BRAIN POWER. Typically, one just reaches into their scrap bin blindly (yes, I know you have 10 scrap bins minimum, but work with me here)….so blindly one reaches for a piece of fabric and then guess what gets sewn next? Yep, you guessed it….another blind reach. I know, it’s scandalous in a world of meticulous nestling, half-square triangles and quarter-inch seams. Breathe. Baby steps, people. See them? Isn’t each one a beauty and work of art all its own? Of course they are! And use them all, I sure will! But, now you know what I’m here working with. This is as “planned” as I’m going to get today….perhaps a tad more. However, I DO recommend when you do this yourself, that you consider the “spontaneous” approach eventually as a goal….live a little, eh? YOU can opt not to do anything except just keep the bag to the right of your machine and sew the next piece that comes out to the next piece you grab out of the bag….I know, daring isn’t it? Live on the edge. And, plus, it’s cheaper than therapy…..I don’t have to ask if you need it, because, well…..we’re all quilters here…..enough said, lol. Ideally, I must tell you, often it’s easiest to begin with a longer strip on the bottom, then laying out the pieces atop it and just sewing (like a banshee) or “chain-piecing” one little scrap after another to that strip until you run out of strip. But the same concept can be applied for any size “strip” (or not so-much like a strip pieces as seen above). Just see my photos above and you will get the idea. And, if you have a “gap” just grab a piece from your stash of scraps that sorta “fits” and fills it in , as in photos 4 & 5 seen above. NO need to stop and cut or so much as touch that scissor button either…just keep sewing, just keep sewing, all together now…. Look at the photos below and remember, this is your masterpiece. You get to decide how your pieces go and in which direction they are sewn to one another…try turning them, anything goes. The above is me “deciding” which of my fabric scraps are gonna be close pals for the remainder of their young lives. And, no, I don’t bother to pin, pinning is for slow folk. We ain’t slow and we ain’t pinnin’, I don’t care what your “b-bu-but”‘s are! Zip it and sew! You can see my lil purple scrap to the right is just simply “at the ready”….again: as planned as it gets. These next peices are more like what you will see in the “traditional” tutorials , with insistence that you always sew to a strip. So, yeah…these are closer to that….sorta accidentally, but I’m pointing them out because it’s the same concept and process, as seen below. Yep, in picture 4 here, I’ve just run out of “scrap” and have a lil gap to fill….and I’ll do so with the fruity fabric shown to the bottom left of that last photo. And a floral lays in wait, conscientous scrap-hog that I am (I’ve always wanted that title)…..
Oooh? Another? You don’t say. The latter of the two photos above introduces a dilemma we haven’t addressed yet. What if your top peice of fabric exceeds the bottom peice? Sound the alarms! Just kidding. Yes, I realize I told you to put the longer piece on your machine first, but life ain’t fair and quilters are half-crazed. We know this. So? Just keep sewing, just keep sewing…. 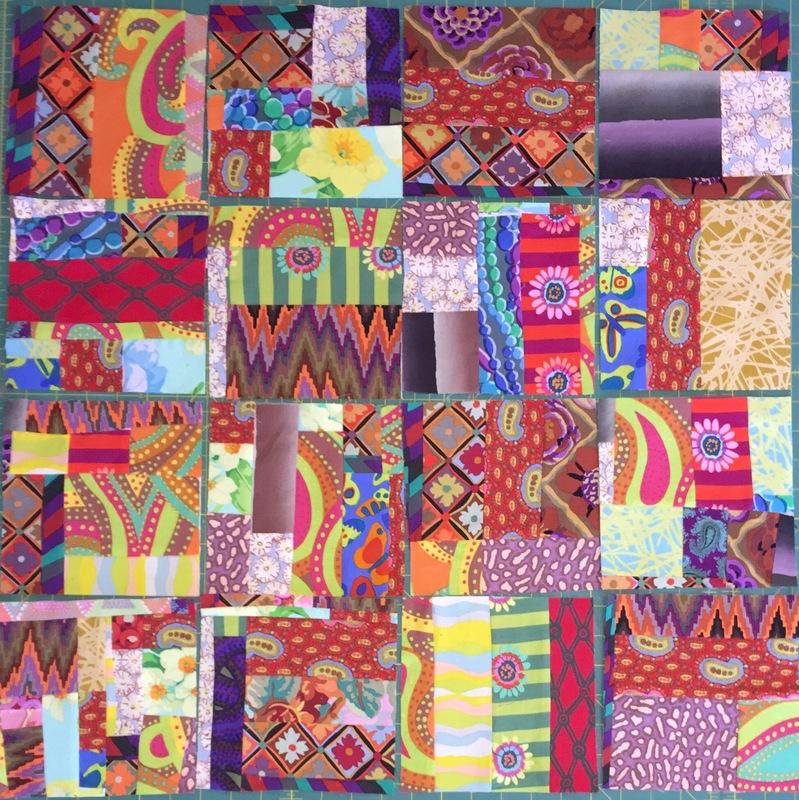 And, ever so simply, yet with ingenius panache, introduce your next epic scrap to take to the sewing stage….mine was designed by Brandon Mably as seen below. Don’t hate. Just keep sewing, just keep sewing…. Now, here I made an executive decision. I was looking for my next scrap. My sweet lil Southern heart just wanted a peice of equivalent size, but, as my Yankee gramma used to say? No such luck, chickadee. What to do? Whatever I wanted to do, that’s what. And I wanted that piece so, I got up (RARE and only to be used in such emergent circumstances when the design must happen just so because, uh, ummmm…you want it to? lol) …so, I got up & went to a scrap, and cut it. Yep, I straight up made my fantasy-perfect-matching-length partner piece. And, I was at peace, and life could then go on. That’s all that’s going on in the photos below. I know, giant segway, very teeny tiny “point” to be had, but still, so you know…. Ahhh…now for the marital fabric bliss in 3, 2, 1…. Now, if you have been obediently sewing….and don’t even think about takin’ your foot off that pedal, missy (or sir)!….you’ve hopefully begun to notice something, which is : you are essentially chain-piecing 2 pieces to each other , over and over and over again. Soon we will cut between each of those “pairs of pieces” with our rotary cutter, and you will have lil, yes, that’s right : “pairs”. See? You are going to sew and sew until all your scrap bag pieces are attached to one another in some fashion and thereby have nothing left to grab from your bag. Think of it like dancing ….and, after all, no one wants to dance alone! Find those bad boys a partner & make it snappy! Ooh….at the end of a “pair”, simply lift that needle up and give it a tug. We want a lil thread chain to play with. Take a look at this thing! It’s starting to look like a pennant flag or some really botchy mantle garland…but, point is, it’s growing. And, in mile-a-minute piecing, growth is a very good thing. The above pictures are so close-ups I took for you of what the “things” or pairs on my “chain” are beginning to look like. I opened up a few so you could see the fabrics as you are used to seeing them, right-side up. Pretty cool, huh? Oh and that whole not-matching thing going on? Yeah. It’s supposed to be that way. Cool your jets, perfecto, this is a scrappy quilt. And, well, it cain’t hardly look scrappy if it ain’t scrappy, kapeesh? In other words, we don’t have time to matchy-match-match, we’re goin a mile-a-minute afterall! smh…. See? It doesn’t matter so much once you get going which piece is where, so long as you keep going. Got 2 strips “at the ready”? Just so happens I sure did, see? If there’s a bit of selvage in your way? Move it out, just will it so, insist it submit to your authority, and take nothing less than full surrender! Just. Keep. Sewing. Gettin’ to be more chain than not, hey now! So, here goes the Nascar-style sewing………Hoo-boy, now we’re cookin’ with gas. Look at this progress!!! There’s a reason they call this type of sewing “chain piecing”….if you have an ounce of intelligence, you’ve probably caught on to why that is the case. Yes, as you can see, all is connected by the thread from your continual-not-leaving-that-chair-nor-taking-your-foot-off-that-gas-pedal sewing action (and like a boss, I might add). The end result is a connected “chain” of pairs of pairs of pairs of pairs…..oops, sorry, I got ahead of myself. As you can see, right now my piecing “chain” is pretty long. But, the more “pairs” of pairs we sew together, the shorter that “chain” is going to get, while my quilt blocks get both wider and taller (and I promise their lil hearts grew 3 sizes today as well). At this point, I’d instruct you to pat yourself on the back and do a few hoots ‘n’ hollers, even take a bow. Except, well, this is my project right now, and so, yeah….you? Just. Keep. Sewing. As you do that, I’ll interject with this: most sites and tutorials out there will tell you to press and straighten or “square” your edges as you go, but NOT THIS CHICK. It ain’t called “mile-a-minute-quilting” for nothing! Sew on!!!! Pressing is for the birds….except for y’all rare folks who just LOVE to press…..and in your case, they make meds for that. In all seriousness, though, press if you wanna press, (and do so towards the darker fabric or the most recently added fabric piece or cluster, your choice), square off if it gives you a thrill. But for my purposes, this is my therapy and frankly I save all of that thinking for when I absolutely gotta….this is about SPEED for me and the exhilarating rush of being one step closer to destashing a corner of my scrap drawer WITH a quilt top growing along the way to boot! Moving right along now….just think, perchance even dream : one less “UFO”, lol. So, everywhere that there’s bare thread connecting these lil projects like they are hanging from it like garland? Cut it. You are separating your now larger blocks (yes, they are becoming more like blocks now, right?) and you will continue to open them, evaluate how they are “taking shape” and think about what you are going to connect “where” in the next go-round….whom are you going to pair with whom? Think about this as you keep cutting them (just keep cutting, just keep cutting, lol.) Hhmmmm…. The next thing you know, you have some fabulously attractive little “cut pairs”, see? So, how to decide which pieces should get sewn together and paired next? Often I gauge this simply by size. For example, if something needs to get wider, then that’s where I connect another piece, you can turn your scrap and connect it to it’s strip or “partner” left to right or top to bottom, it doesn’t matter. I try to match sizes on some level to waste less fabric, for every time you sew a ¼” seam, your project shrinks a little. So, use your gut here. Go with what you like. Don’t worry about staying straight, these are supposed to look scrappy. Speed. It’s all about speed. The only time we even hint at thinking about precision is when we are cutting between our clusters or when it’s obvious you have a raw edge atop a larger piece, and need to cut it off, without cutting into another pair, but instead to form one straight(ish) edge, so that this new piece can be again paired with another, and lined up to sew….see below, as these are now “pairs of pairs” and have been pieced accordingly. My, how they’ve grown! (sniffle, sniffle)…. Once you’ve done the littlest bit of straightening up or if you must press or square off, then pull another strip or a longer pieces from your stash and begin sewing scrap pairs to it. Or, as is often my case, if you’ve decided you have more “pairs” you’d like to put together and you know whom you’d like to go with whom…..get back to the grind, foot to the pedal, pedal to the floor…..you get the drift. That’s right. Waste no time & take no prisoners. If you’re scraps wanted to stay UFO’s, they need be runnin’ bout now, just sayin’. To join or not to join? To pair or not to pair? These are the questions, right? Essentially, sometimes this type of “off-the-cuff” spontaneous block design & the decisions required, boils down to what size block you are making. For, it can be any size you wish it to be. For purposes of this tutorial and our monthly club, mine are 6.5” completed. Now, as I was sewing these, I could visually guestimate that some were getting quite close. Or perhaps that some were quite wide one direction and not quite 6.5” the other way. So, where they need the growth, that’s where you add to them. And, personally, I try to match mine to blocks (pairs of pairs of pairs now sewn together) of similar sizes. What doesn’t have something to “connect to it”, will get cut off eventually as you do your “squaring-off” of blocks, after you have disconnected them from your chain. You are starting to see the point, now, I hope, and a very detailed look at the creative process involved, albeit an extremely casual one. So, continue the above steps over and over again , speed-piecing your scraps onto a larger piece / strip or equivalent size scrap until you have a chain and no more pieces to add to it. Then, remove it from your machine and cut them apart. Open them up, take a look. Evaluate your goods and the inventory of stash pieces you have. How big are they? Do they need more variety in color / fabric? Or, do they need length or width added? Should you turn them? Questions like these will help continue to guide your decisions as you go along. Just keep sewing, just keep sewing, lol…. And, really , I reckon you could just mindlessly add pieces until you ended up with a quilt top , but then that’s not a block or a stack of 6.5” blocks, now is it? So, don’t get too carried away now. Though, there are great quilt patterns and other speed techniques built around those very concepts (Google the jelly roll race quilt if you are still scratching your head on this one….and you may wanna consider “getting out” more, lol). So, yes, as you can see from the photos above, it’s the same process that got us going in the beginning: once you have the chain, you separate using a straight edge, then open and add, turning your blocks as needed as you pair them and grow them larger, each time closer to their final size. Every so often, you step back and evaluate the goods, getting an aerial view, and then you hone back in on the details of construction (a.k.a. : get your foot back on that pedal, missy!-or mister). To end this, I’ll touch on “trimming” your final blocks, to the 6.5” size. Once your blocks are 6.5” , ideally closer to 7” in all directions, you are going to trim them back and square those edges to make a completed 6.5” square block. And, now, I do insist on pressing so that you can ensure that your pieces are accurately cut to size once you begin their final “squaring-off” and sizing to 6.5″. Now, isn’t this starting to look nice? Funky, yes, but oh-so-nice all the same. In other news: your final cuts…. If you happen to have a 6.5” square ruler, you can get a little more creative if you want in your final cutting (with blocks that exceed 7”)…or you can just use it as a template of sorts to get your square cut. Now, when you lay it down, you can turn it some to the right or left or line it up at a perfect 90-degree angle. It’s totally up to you. I kept mine straight for purposes of this tutorial. But, play with it and you will see, as long as you keep that square to be 6.5” on each side, you can use that ruler to cut it at different angles creating some interest. Otherwise, just a standard ruler that you use with your rotary cutter and cutting mat will work just fine to square off at 90” angles. Here, I’ve used my “Add-A-Quarter” Ruler, because, well, it’s like my safety “blankie” and is never far from me…but any quilting ruler will do. Do know also, that you very well may have pieces that get “lopped” off or chopped from your blocks. No fear, just throw em in your scrap bin for next time. Just, please stay safe as you gun it down UFO-killin’-Scrapbustersville, okay? Don’t sew through your fingers. And, please, whatever you do, HIDE YOUR SEAM RIPPER. In this venture, it really IS evil and out to get you. In Mile-a-Minute-Land, seam rippers only stress. Wonky is king. Whereas straight seams , perfect piecing and precise planning is what only the boring quilters do. Don’t lack such imagination. May your bobbins always be full and needles threaded at the ready.